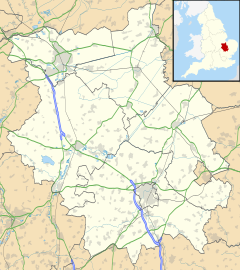 Longthorpe is a village in the city of Peterborough, Cambridgeshire, in the United Kingdom. Located two miles (3.2 km) west from the city centre, the area covers 1,390 acres (560 hectares). For electoral purposes it forms part of Peterborough West ward. A 1st century Roman fort was established at Longthorpe, it may have been as early as around AD 44–48 but was certainly present by 61–62. The first phase covered 27 acres (11 ha), this was later replaced by another fort measuring 11 acres (4.5 ha). The ecclesiastical parish was formed in 1850 from the parish of Saint John the Baptist. The church of Saint Botolph is a plain building of coarse rubble, dating from the 13th century, consisting of chancel, nave, aisles and a western bell cote, containing one bell. In the chancel is a piscina and aumbry, two other brackets and a piscina are in the south aisle and two brackets in the north aisle. The church was restored in 1869 and will seat about 200 persons. The register dates from the year 1837; the earlier register is included in that of St. John the Baptist, Peterborough. Oliver St John, a Lord Chief Justice who supported Parliament in the civil war, bought the lease of the manor of Longthorpe and built Thorpe Hall. In 1654 it was described by the author John Evelyn as "a stately place...built out of the ruins of the Bishop's Palace and cloisters." It is a Grade I listed building, situated in a Grade II listed garden open to members of the public throughout the year. Longthorpe Tower, a 14th-century, three-storey tower and fortified manor house in the care of English Heritage, is also situated here. A Grade I listed building and scheduled ancient monument protected by law, it contains the finest and most complete set of domestic paintings of the period in northern Europe. Exhibitions are held there from time to time by local artists. Longthorpe contains a number of other listed buildings, including the old Manor House and the Holy (or St. Cloud's) Well to south-east of the Manor House. Longthorpe Primary School is located in the village on Bradwell Road; secondary pupils attend nearby Jack Hunt School in Netherton. This page was last edited on 30 October 2018, at 14:25 (UTC).